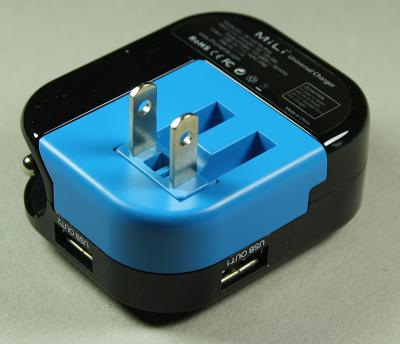 I received a Mili universal USB charger for review from Mobile Fun. This interesting charger has some features that make it my current favorite travel charger. It runs off both wall power and car accessory power. It comes with swappable plugs for Europe, UK, US, or Australia, and runs on 120 or 240 volts. It has two USB outputs - I thought this was pointless until I discovered how useful it is in car trips if two people can charge at the same time. In addition, one of the ports provides 10 watts for charging tablets (when plugged into AC). The charger also lights up - red indicates charging, and green indicates the devices are charged. The charger has a few disadvantages. It is a bit expensive with a list price of $49. Measuring about 2 3/4 inches by 2 1/4 inches, it's much larger than Apple's super-compact inch-cube charger - although it has much more functionality. Finally, due to the design, it ends up blocking both outlets when you plug it into the wall. In the remainder of this article, I test the performance of the charger both in the car and with AC power. To summarize, the power quality is excellent in the car, but has more noise than the average charger when plugged into the wall. 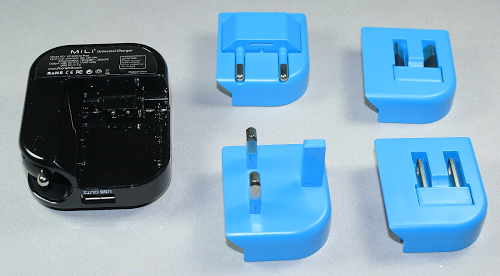 The Mili charger with adapters for different countries. The label shows that when connected to AC, the charger is rated as 2.1A for output 1 and 1A for output 2; that is, it is designed to power an iPad from output 1 and a phone from output 2. When plugged in to a car accessory outlet, it is only rated to provide 1 amp, so charging a tablet will be slower. In the measurements below, I find that the charger's power exceeds these ratings when plugged into the wall, which is good, but provides a bit less than the expected one amp when plugged into a car output, which may make charging slower. Label from the Mili charger. Apple devices can reject "wrong" chargers with the error "Charging is not supported with this accessory"; Apple uses special proprietary voltages on the USB data pins to distinguish different types of chargers (details). 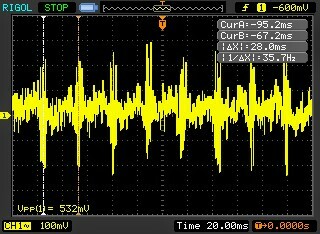 I measured these voltages on the Mili charger and verified that it is configured to appear as an Apple 2A charger on ouput 1, and an Apple 1A charger on output 2. You might expect to find 12 volts at your car's accessory outlet, but what comes out can be surprisingly noisy and variable. This voltage will have spikes from the ignition system as well as very large transients due to starting, malfunctions, or jump starting. A car charger must handle this hostile voltage input, and make sure the output to your device is smooth. Test setup to measure charger performance in a car. I measured the voltage in my car to see what happens in a real-world environment using the setup illustrated above. The Mili charger is plugged in just to the left of the gear shift. 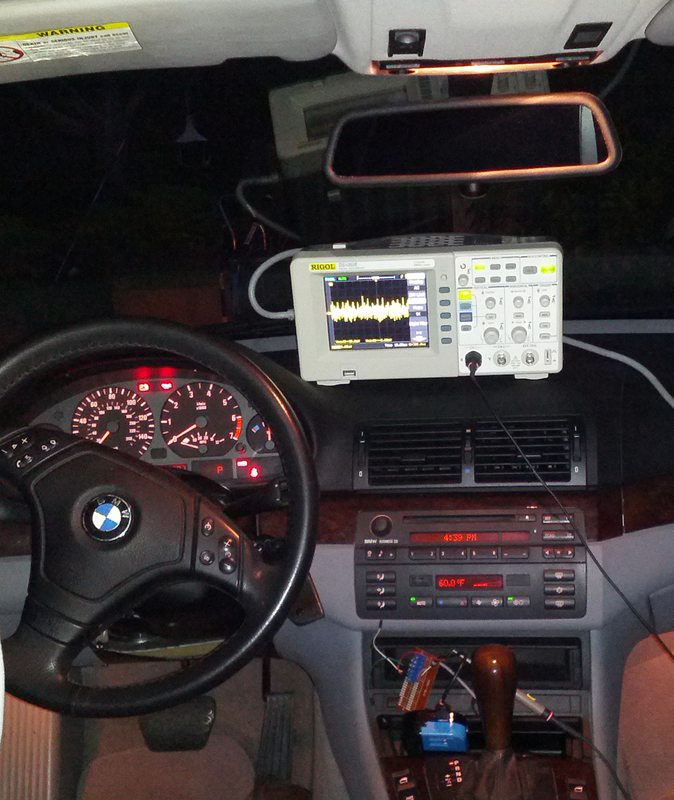 Above it is the USB interface board, which is connected to the oscilloscope on the dash. Car voltage drops and rises when the car is started (left). Car voltage at idle showing ignition spikes (right). 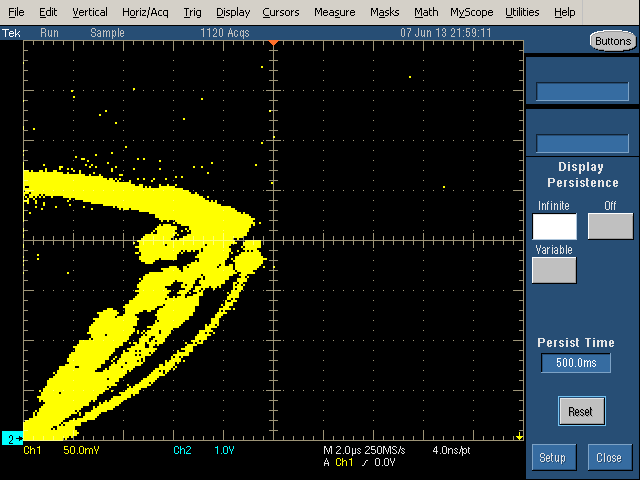 The oscilloscope trace (yellow) on the left shows the large voltage fluctuations when I started the car. At the very left, with the ignition off, the battery provides about 12.5 volts. The starter pulls the voltage down to 8.88 volts until the engine starts. The voltage gradually rises over 6 seconds, settling around 14 volts. 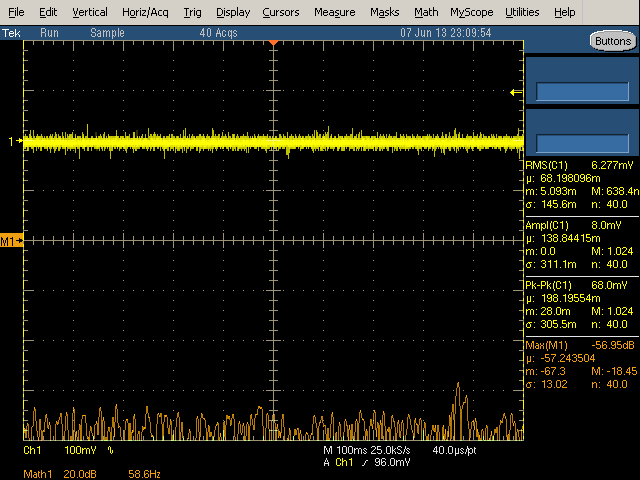 On the right, zooming in shows that while the car is idling, the accessory output has 1/2 volt spikes every 28 milliseconds, due to the ignition firing. Note the voltage on the left is much noisier with the car running than on battery - the line on the left is thin, and the line on the right is thick. The Mili charger has a plug that folds out from the side for use in a car. While this makes the charger larger than a dedicated wall charger, having a charger that works both in the car and with AC is more convenient than I expected, especially when traveling. 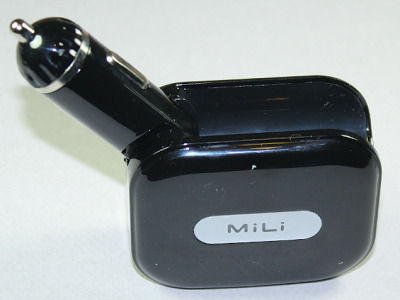 The Mili USB charger with car adapter. 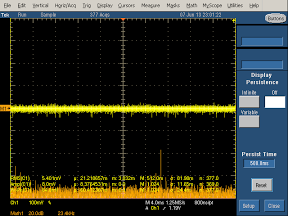 I looked at the output of the Mili charger while starting the car, to see if the large voltage fluctuations shown above affected the charger's output. The Mili output remained steady, which is good. I also didn't see any of the ignition spikes in the output from the Mili charger. This indicates that the Mili charger does a good job of filtering out noise from the automotive environment. I tested the Mili charger with inputs from 0 to 30 volts. 30 volts may seem excessive, but jump-starts often use 24 volts, and car electrical failures can result in a 120 volt "load dump". Fortunately, the Mili survived 30 volts just fine (unlike some other chargers I'm testing). The image below shows that the Mili generates a stable output voltage (horizontal line) for inputs from 7 volts to 30 volts. This is a good thing, showing that the Mili won't overload your phone even if your car is providing too much voltage. 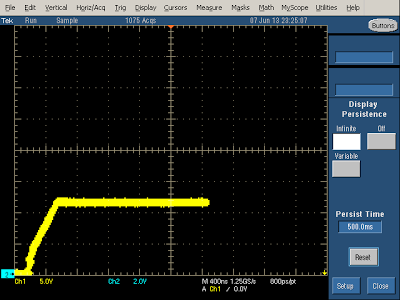 As expected, the Mili can't produce the full output voltage if the input voltage is too low (left side of the graph). Output voltage (Y axis) of the Mili charger as the input ranges from 0 to 30 volts (X axis). 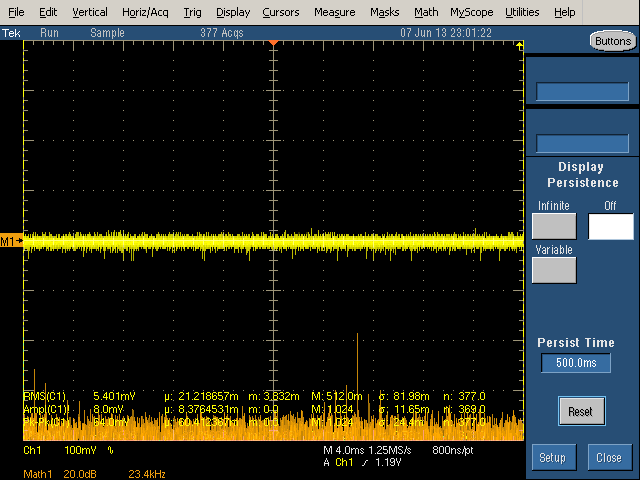 The oscilloscope displays below show the output and frequency spectrum with 12V DC input and a 5W load. The power quality is very good - the yellow line is thin and has very few spikes. 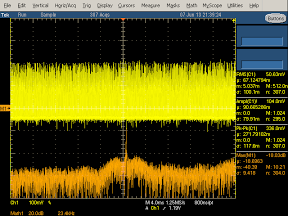 The high frequency spectrum (orange) shows a spike at the switching frequency, but overall the power quality is among the best of chargers I've looked at. 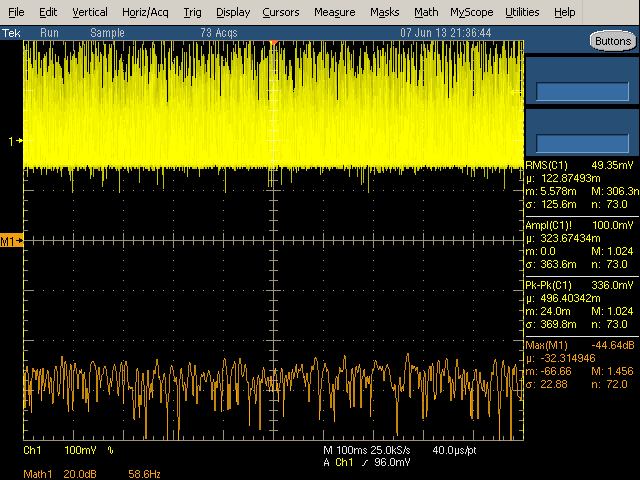 High frequency spectrum (left) and Low frequency spectrum (right) of the Mili charger on 12V input. Next, I measured the voltage the charger can provide under increasing load (details). The horizontal line shows the voltage drops from about 5 volts to 4.5 volts as the load increases. The vertical line shows the charger maxes out around .9 amps with less than the expected 5 volts. This is slightly less than the rated 1 amp the charger is supposed to provide. Both USB outputs provide the same current when plugged into a car outlet. 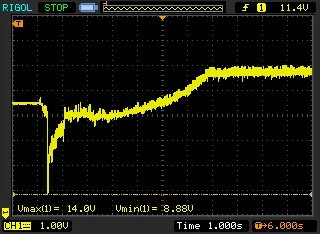 Voltage vs Current for the Mili charger with 12V input. I also examined the performance of the Mili charger when plugged into the wall (120V AC). One minor annoyance with using the Mili as a wall charger is that due to the position of the USB ports, both wall outlets are blocked either by the charger or USB cables. Voltage vs current for the Mili charger (output 1 left, output 2 right) with 120V AC input. 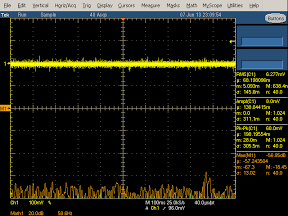 I looked at the voltage output along with the high frequency and low frequency spectrums (below), to examine the quality of the power outputs. 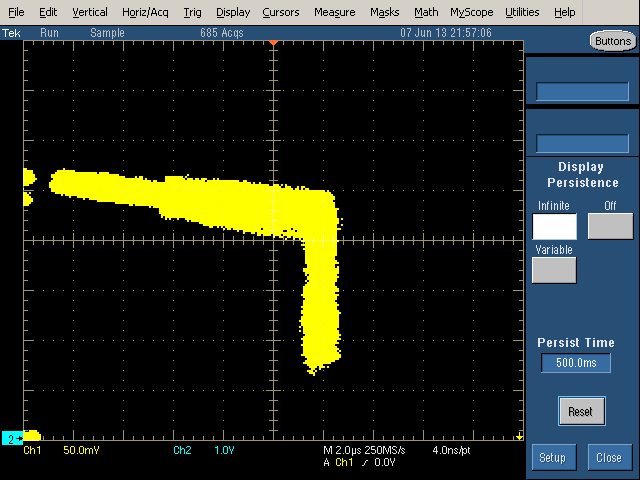 The yellow line is much wider than when plugged into the car outlet, showing a lot more noise in the output. 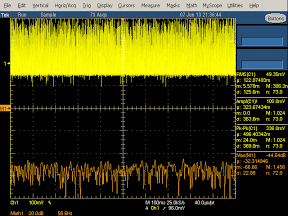 The large orange spike in the middle of the high frequency spectrum shows that a lot of the charger's switching noise is appearing on the output. Compared to other chargers, the power quality is lower than average. On the positive side, the flat low-frequency spectrum shows the charger is very good at eliminating ripple due to the 60 Hz power lines. 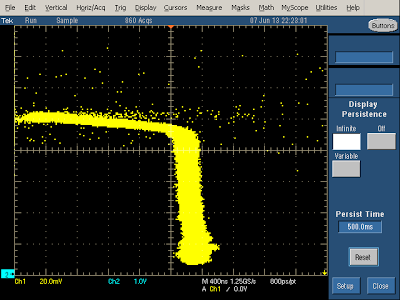 High frequency (left) and low frequency (right) spectrum of the Mili charger with 120V AC input. The Mili charger is convenient for travel because it has plugs for multiple countries, works as an auto charger, and has dual outputs. The power quality is very good in the car, but not so good with AC power. This charger is my favorite charger now - while I'd like to tear it apart and examine the circuit inside, I like it too much to destroy it. Hopefully if you get one you'll like it too. And if you found this interesting, check out my detailed analysis of a dozen chargers in the lab. Thanks to Mili, Mobile Fun, and Mihnea for providing me with the charger and patiently waiting for the review. Nice car. I love manual transmission. This made driving a car itself a fun. But I wonder whether people like you particularly incline to such option. That car is clearly automatic... Notice the two pedals? Btw, good article Ken. I learn something new every time I read one of your posts.